The kowtow is an ancient Chinese way of showing respect, reverence and gratitude. ‘Kowtow’ is the Cantonese spelling for pinyin kòutóu 叩头 which means literally ‘knock head’. The full kowtow comprises three kneelings and nine knockings of the forehead on the ground. Nine is a ‘yang’ number associated with the Emperor. Some held that a proper kowtow requires the sound of the skull hitting the ground to be heard. The lowest was the 拱手 gǒng shǒu the cupping of hands one around the other and bringing to the chest. In the next the joining of hands is accompanied by a low bow 作揖 zuò yī. The third involves kneeling on the right knee only and reaching down with the right hand 打千 dǎ qiān. The next was kneeling but not bringing the forehead to the ground 跪 guì. The fifth is a single kowtow 叩头 kòu tóu. The sixth 三叩 sān kòu is three kowtows. The seventh 六叩 liù kòu is two sets of three kowtows getting up in between. The full abasement is the 三跪九叩 sān guì jiǔ kòu of three separate kneelings, nine knocks of the head. Some minor gods received the three kowtows, others six, while nine was reserved for heaven and the Emperor. Following the Confucian tradition set out strict rules as to which procedure was appropriate and when – it demonstrated thanks rather than a greeting. 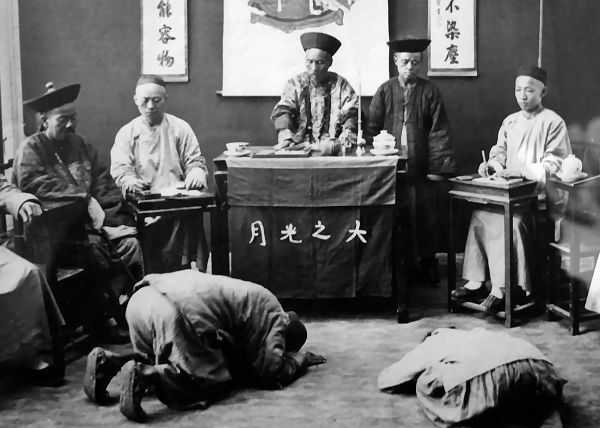 Note that because Chinese people, up until recent times, sat down in a kneeling position rather than on a chair the act of kneeling is not as unusual as it is in the West. The Chinese Emperor as the ‘Son of Heaven’ performed a kowtow to the heavens from as early as the Zhou dynasty onwards. The Emperor would also kowtow at Confucius's ancestral shrine at Qufu (first documented in 1008CE) confirming the importance of Confucius to the Imperial system. Unless a senior person indicated otherwise the correct sign of respect was compulsory. If they allowed someone to forgo the salute they would say : 不用行礼 bù yòng xíng lǐ “no need to salute”. The ambassadors of foreign and tributary states showed their acceptance of China's preeminence by performing a kowtow to the Emperor. For 250 years (up until 1896) Korean kings performed the kowtow to the Chinese Emperor. In true Confucian manner the Emperor's obeisance to Heaven trickled down the hierarchy of ordinary relationships. People kowtowed at courts of law to the magistrate and to the Emperor, it was a formal recognition of respect. The Emperor himself would kowtow to his mother or other dowager Empresses, as reverence to the older generations beat any other consideration. At a marriage couples would kowtow to their parents; schoolchildren would perform the full kowtow to Confucius twice a month and the ‘sankou’ to their teachers. Abbots of monasteries kowtowed to Buddha; graduates kowtowed to their professors. On the foundation of the Republic schoolchildren would instead kowtow to a portrait of Sun Yatsen chanting the words of his will every Monday morning. The tradition was mainly abolished under the People's Republic, no-one kowtowed to Chairman Mao, and now the custom is reserved for veneration of the ancestors at the family's burial ground. The kowtow became a major issue for the British ambassador to China, the Earl Macartney ➚ in 1793. Other European ambassadors to China had up until then performed the kowtow without much fuss. The pre-eminence of British military; financial and technological power had been growing, Britain refused to admit that a non-Christian state deserved deference as if England was an inferior. So British protocol insisted that obeisance was restricted to removing a hat and making a respectful bow to the Emperor and not a full kowtow. 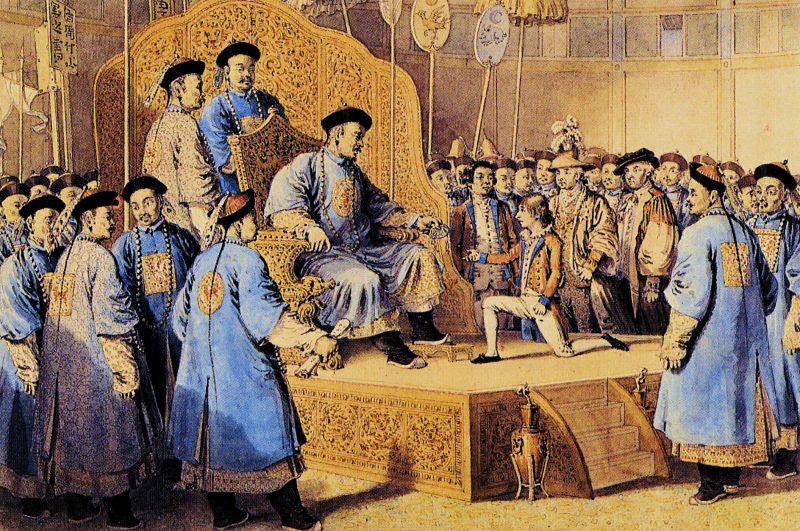 Heshen ➚ the Emperor Qianlong's favorite reported to him that Macartney had kowtowed when he had only bowed. The embassy continued to ignore protocol despite written instructions and explanations on why it was required. The British position admitted a possible compromise that stated that if the Emperor would kowtow to a portrait of King George III; Lord Macartney would kowtow to the emperor. Because the Chinese tradition was that there was, and could only be, one ‘Son of Heaven’, the compromise was rejected and so the ambassador went no further than going down on one knee. A Russian mission to China 1805-6 failed on similar grounds. In this case Count Golovkin refused to kowtow to three scented candles that was traditionally used to represent the absent Emperor, he was sent packing with the message ‘You are a daft race. Begone!’. Lord Amherst led the next British embassy to China and this mission failed completely on the issue of the kowtow. When he arrived on August 29th 1816 he was ordered to immediately go before the Emperor even before his official dress and diplomatic gifts had been unpacked. The Emperor planned to make up for Lord Macartney's dubious kowtow by insisting that Lord Amherst would perform the full abasement. Lord Amherst refused point blank to obey. To avoid the likely embarrassment of a confrontation before the Emperor the officials made sure any Imperial audience would be impossible. This did not prevent Amherst from making a long and detailed exploration of China ➚, especially the Yangzi River basin leading to the establishment of the British Shanghai settlement soon after. Napoleon was of the view that Amherst should have adopted Chinese customs, just as the Pope insisted that visiting dignitaries should kiss his toe. 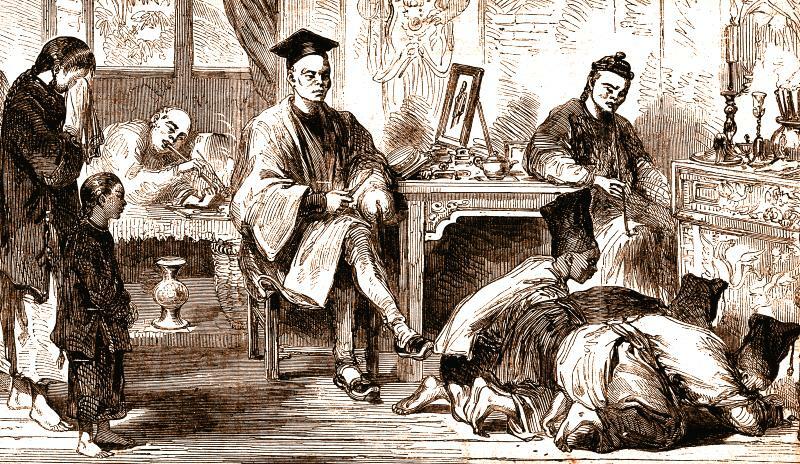 One of the concessions exacted from China at the end of the Opium Wars was the dropping of the requirement to kowtow in 1873. Citation information for this page : Chinasage, 'Kowtow - Showing due respect', last updated 21 Nov 2018, Web, http://www.chinasage.info/kowtow.htm.